The past few weeks have seen me make a start on a huge learning curve…… finding out what plants are growing in the eight-and-a-half acre patch of mixed woodland round the corner from my home. Norfolk Wildlife Trust have just launched a scheme, backed by the Heritage Lottery Fund, to check on the health of some County Wildlife Sites and churchyards and have roped in volunteers to try and discover what’s growing where. In a more adventurous moment, I agreed to give it a go, although my knowledge of plants is small, to say the least. “You don’t need to be an expert,” I was told as I was handed a small hand lens at the end of an introductory talk. Thankfully, I’m not alone in my efforts to discover the plant life of Reffley Spring Wood – I am sharing the task with three other volunteers! We have to visit the site at least once a month between now and August or September, then put our findings together so the Wildlife Trust can produce a management plan during the winter. Our enterprise began on May 4th, when our supervisor/mentor and another knowlegeable person from the Trust accompanied us for a preliminary walk round our site. It was then that we discovered a patch of pignut, which I gather is more often found in churchyards in Norfolk. It is a member of the carrot family of plants and the Trust representatives were delighted to have found it. 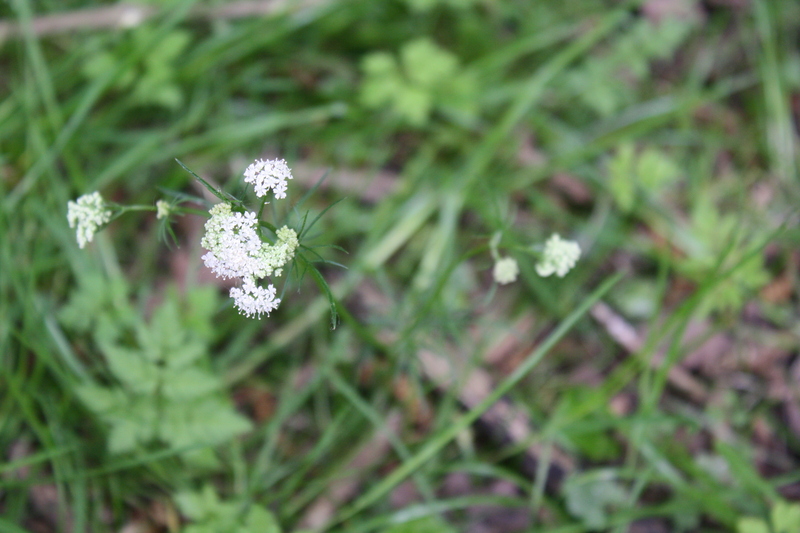 Pignut – an ancient woodland indicator species. This initial tour was followed a week later by a more in depth affair, led by Norfolk naturalist and colourful botanist, Nick Acheson. He described various plant families and their characteristics so that we could at least start to narrow down our choices for final identification. Our patch takes in the pond and the area around it, some of the common and then the wood itself. So there should be plenty of plants, large and small – trees are included. What a tall order this exercise is going to be! We spent some time examining plants around the pond and in the pond and tried to decide which willows were growing closeby. “The best habitat is one that has not been improved,” Nick told us. “Those that have been improved will have nutrient loving thugs in it.” He thought the soil on the common had been moved about. In the wood, as well as the pignut, we discovered enchanter’s nightshade, both of which Nick described as “real indicators of ancient woodland”. (Ancient woodland has existed for at least 400 years.) The pignut was so called, he said, because in earlier centuries, people would release their pigs into the wood and the animals would dig up the plants and eat the roots. Reffley Spring Wood, in common with the nearby Woodland Trust owned Reffley Wood, does boast a sizeable patch of ramsons, or wild garlic. Nick told us that the King’s Lynn area was the only part of Norfolk to have this rather aggressive plant. I think the wild garlic makes a very attractive display each year and of course it also provides a sensation for the nose! 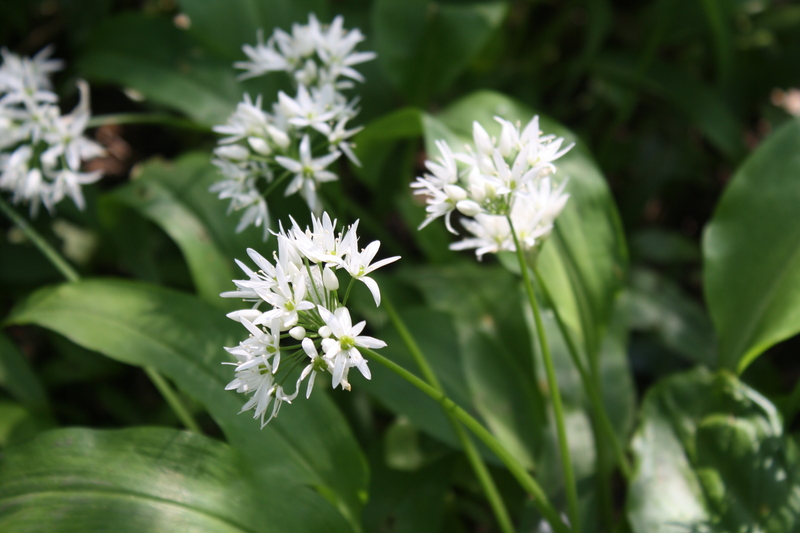 Wild ramsons, or garlic, look very delicate close up. Although Nick helped us find around 40 plants for our list, he thought Reffley Spring Wood seemed a bit impoverished, with not so much biodiversity as might be expected. Things did not seem to be going well. 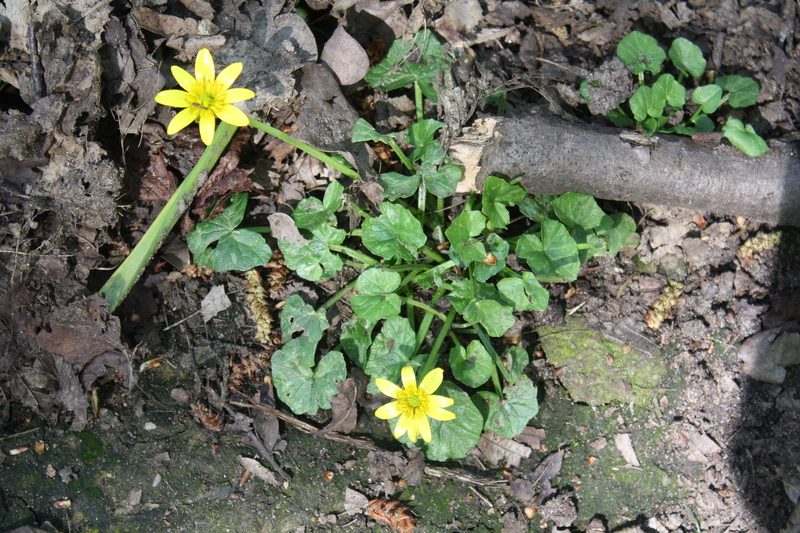 The lesser celandine and dog’s mercury looked weak and the herb bennet (or wood avens) was a poor looking specimen, he mentioned. Afterwards, I wondered if all the soggy weather we’ve had was partly to blame – the wood has been much wetter this year, with several patches of standing water gathering. Could things just be rather late? Last year, the lesser celandine had seemed more plentiful. The plant list includes: lords and ladies, cleavers, garlic mustard, mouse-ears, and shepherd’s purse. Among the trees in Reffley Spring Wood are plenty of sinewy hornbeams; young ones are popping up all over. There are also several oaks that have obviously been in situ for several hundred years. While we were surveying in the spring sunshine, the place was alive with birdsong. 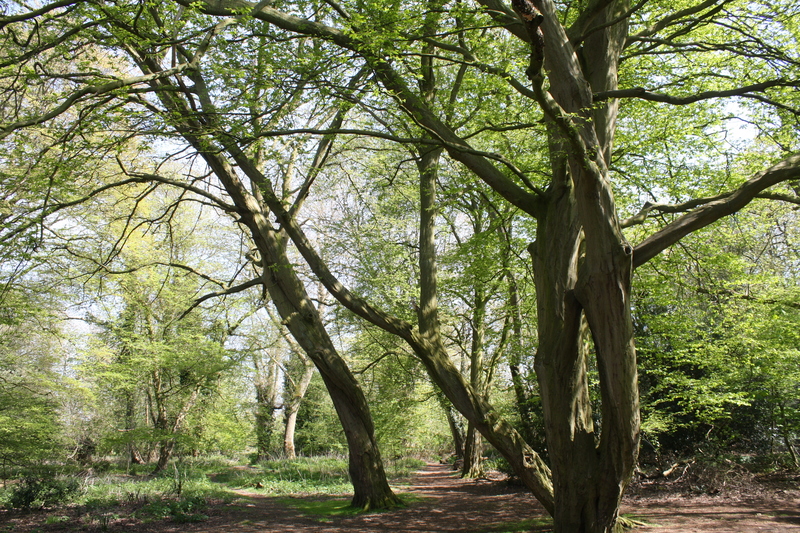 These impressive hornbeams stand just inside Reffley Spring Wood. In contrast, a marshy stretch across the path-way from Reffley Spring Wood – which I think we may be keeping an eye on, if we have time (some hope!) was “improving and coming along nicely”. Along here, we uncovered St. John’s square-stalked wort, water forget-me-not and water mint. Since then, we four volunteers have spent about a day and a half surveying the wood, armed with field guides, sample tubs, cameras and our trusty hand lenses. We seem to have uncovered some more patches of pignut and a single cuckoo flower in the grassy common, and for me, for the first time, I’ve noticed silverweed in flower. 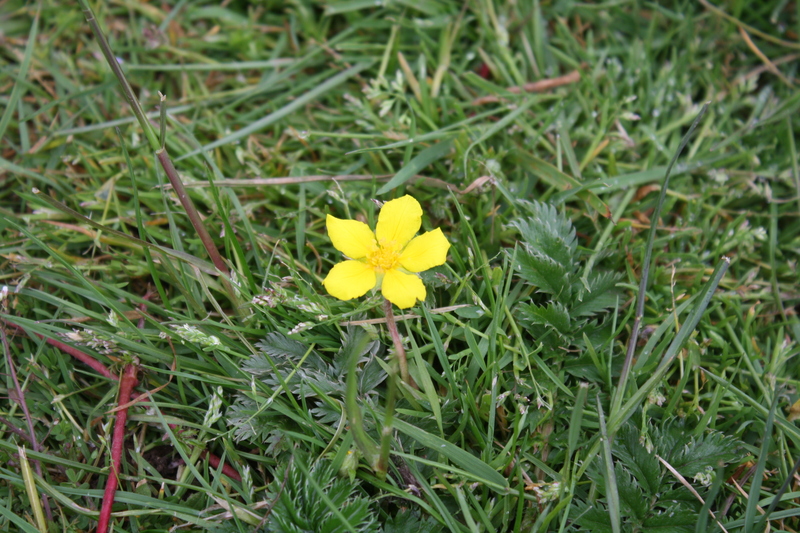 The silverweed is currently in flower near the pond. Yes. it’s proving to be a mind boggling job! I know plants are fundamental to any habitat and a knowledge of them is very useful, but I usually take more notice of the birds, mammals and insects that are around. However, I felt I should help as this wood is part of my local patch and it has existed for many years and all this will help increase my knowledge of it. Currently, it is leased to the Reffley Community Association by the King’s Lynn and West Norfolk Borough Council. A year or so ago, the Council started work on a fresh, 99-year lease for the wood, but I’ve been told that plan has come to a halt and now the Community Association have returned to a lease with only 19 years left to run. And that lease includes some ridiculous conditions considering it is a wild place which should support many different creatures. It’s an oasis in the middle of a housing estate and helping to provide a living landscape and so it should remain for many more years. 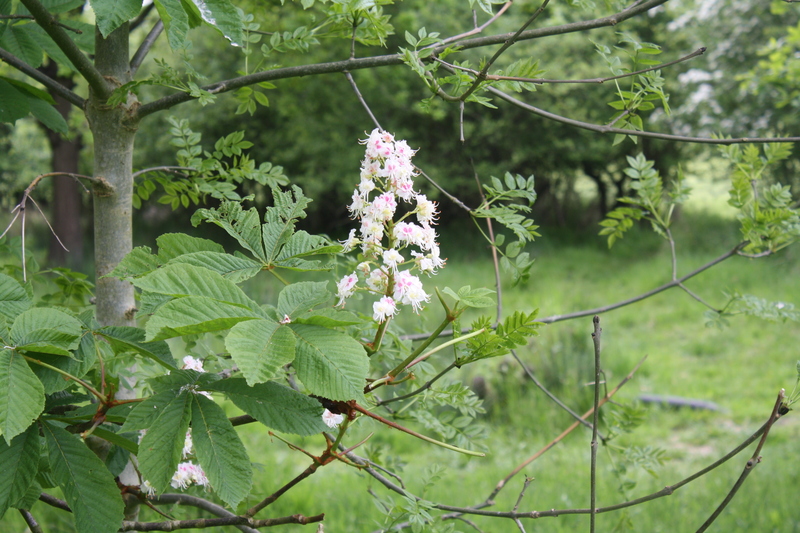 Like candles, the pink and white blossoms adorn the horse chestnut tree. A great read Elizabeth, I am so glad you and your team are giving it your best shot as there is no way I could tackle such a complex task. It’s good know we have plants that may have been around for centuries and let’s hope we can keep them. Is there any advice from NWT on how to help those plants that seem to be struggling? Maybe sorting out the drainage is up there in the priority list as this year it has been very wet. Please keep in touch and don’t hesitate to ask for help if you need anything. Thanks for your kind words. The weather this spring has been challenging – sometimes warm, sometimes cold and quite often wet. And all that following a mild winter. Probably the plants don’t know whether they are coming or going! It must also depend to an extent on the types of soil in the wood. I suppose the wood shouldn’t be excessively wet – the ditches were put there for a reason, I guess. Of course, the deer do tend to chomp away at things, as well. Unfortunately, we have to wait until the winter for the NWT to work out a management plan. What a great challenge, good luck! I’m sure you’ll get to grips with the plant ID quickly, sounds like there’s a lot in your patch. Thank you – I’m not sure I share your confidence in my abilities, but I’ll keep working on my plant ID skills: we have got plenty on our patch to keep us busy for a while!